Decades ago, it was standard practice for album projects to be started and completed in a single studio. Tracking, overdubs, vocals, mixes — all were done in the same room, often in an unbroken block of time. That’s not the case today, though; basic tracks can be recorded in any number of different studios (as time and budget permit), overdubs can come from anywhere in the world, and vocals can be recorded whenever and wherever the vocalist is comfortable working. And finally, it’s possible to send tracks to yet another studio for mixing. 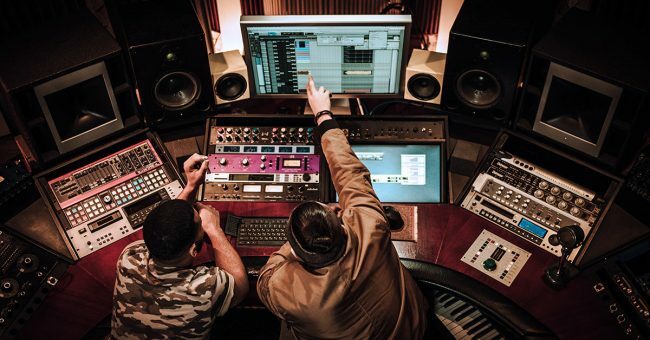 For artists, the benefits of using multiple studios are pretty obvious; they can work wherever they happen to be, and they can use the musicians (and engineers) who are best suited to their specific project — wherever those musicians might live. Besides, while a studio with a large tracking room and great microphone collection might be necessary when tracking a live band or overdubbing a string section, a smaller — and possibly less expensive — room may be perfect for overdubs, editing, or mixing. But collaboration benefits studios, session musicians, and engineers as well as artists — at least those who can position themselves to take advantage of the ease with which data can be sent around the world. If you’re a studio owner with a client who wants uncommon instruments like pennywhistle, steel guitar, accordion, a full horn section, or even a string orchestra, you can keep your client happy by collaborating with other studios that have access to the musicians who play those instruments. Here at Sweetwater Studios, we embrace the use of collaboration and regularly work with studios and musicians in other parts of the country and around the world. Projects may originate here and go elsewhere for overdubs, or begin elsewhere and come to us at Sweetwater Studios for our in-house musicians to add parts. Some of our clients record basic tracks here and mix elsewhere, and we also mix projects that were recorded in other studios. Depending on the situation, there are different ways that various audio files should be prepared to share with others. Here are our suggestions for preparing files for working online with other musicians. i either old drum tracks or programmed drums helps us know what direction you want, but we’ll definitely want to play with a track that does NOT have the old drums. When you’re sending a rough mix out to a musician for overdubs, make sure that you explain the format (bit depth/sampling rate) that you’d like for them to send back. Note the sampling rate and bit depth of your own multitrack session. For example, our standard tracking sessions are 24-bit/96kHz, so we ask our musicians to send us consolidated mono 24/96 WAV files. “Consolidated” means that the file is a single, continuous audio file that starts at the beginning of the session. When we get audio files that are at the same sampling rate as our session, those files can be imported into the session without having to convert them. One last helpful item — when you send out rough mixes (again, starting from the beginning of the session or project you’re working in), you don’t have to send out high-resolution WAV files; we typically send out MP3s, since those can be emailed rather than uploaded through a service like Hightail or Dropbox. When the overdubs are sent back, however, those need to be high-resolution files — and therefore are too large to send via email. Using a Private VPN Server works well.